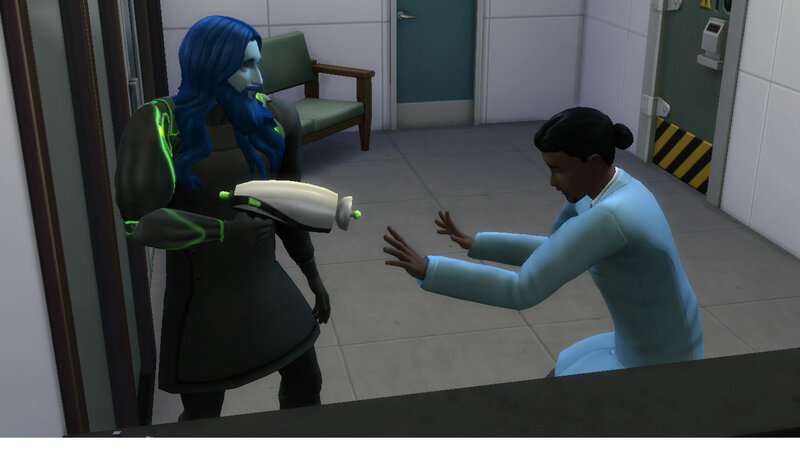 Yes, the scientist is Sims 4 Dr Prometheus Hyde, the Watcher of the STM Universe. – The middle levels of the science career have nice light blue lab coats 🙂 That’s what FutureSims Lab has in common with Hyde Dynamic. – Many of the work-related goals are to experiment on one’s coworkers. 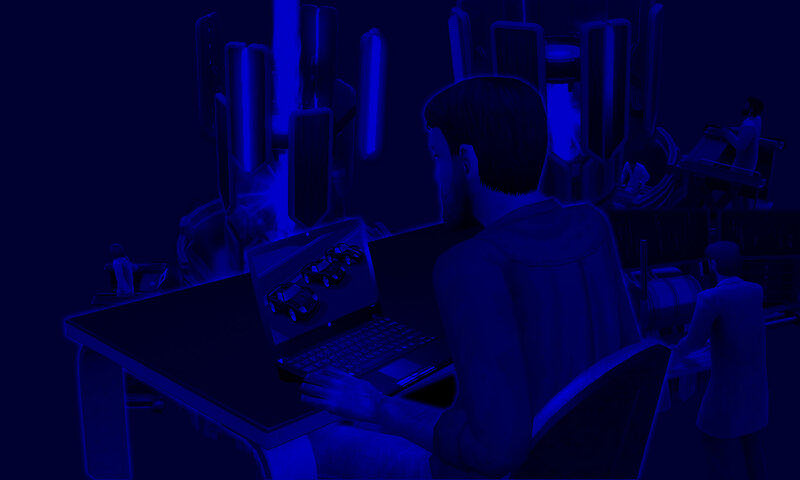 Use the Sim Ray to freeze or mind-control coworkers, test serums or tainted serums on coworkers. While Nervous Subject was the Beakers’ guinea pig, STM Bianca Monty, Kent Capp, Vidcund Curious and the Racing Men are NOT exactly my test subjects in that same sense. It’s much “easier” to do these things on random townie coworkers. – However, on the bright side, the scientist coworkers do actually experiment, and can be “ordered” to do constructive things like gardening, cleaning, building the rocket, or experimentation on various substances. – FutureSims Lab has many nice “toys”. I find the Invention Constructor to be the most fascinating attraction (see first pic), with interesting animations and invented products (Sim Ray, Satellite Dish, Cloning Machine, Wormhole Generator etc). It is also particularly endearing to be able to converse with the Robot. However, the Invention Constructor cannot be unlocked for home use, not even in debug mode. So scientists can only invent during working hours, which is particularly annoying if I want to create multiple copies of the same device. 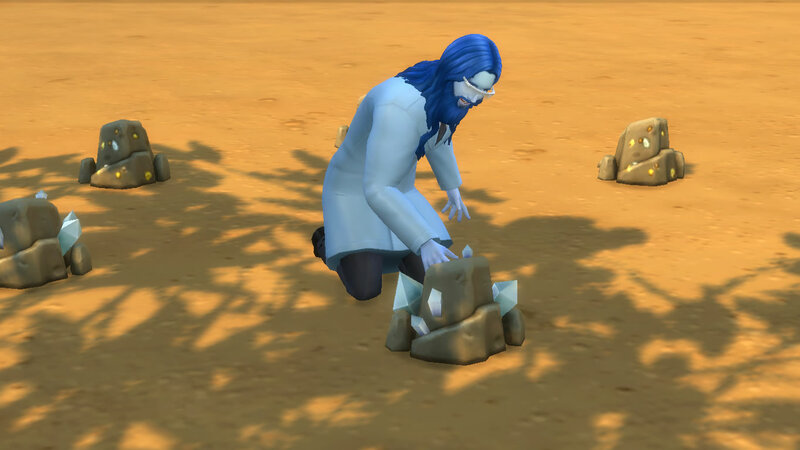 – Sim metals, crystals and elements have pseudo-scientific names, which puts them in a whole new classification that I consider “Sims Science”, as opposed to the real-world science that I’m familiar with. – Sometimes, I don’t have the required metals, crystals or plants required to synthesize serums or to create the inventions, and may not be able to procure them on time to achieve the day’s objectives. – I find the lab layout to be inefficient, as too many precious sim minutes are wasted on walking/running from one point to another. – For the “Restocking Day” Work Program, where my scientist must dig up many new metals and crystals, I could never finish the day with Gold performance (even after staying late), because too much time is wasted on walking/running from one digging point to another. – So when I get the requisite number of Breakthroughs for promotion, I send my scientist “alone” to work, starting with the Very Focused emotion, and ending with the Tense emotion for having worked too hard, but Happy at being promoted. – The L9-10 futuristic black lab coat with the bionic arm is excellent. Sim-Ray Transformed Sims may end up with different hair colors or skin tones, and a “Transformed” (Happy +1, 2 days) moodlet. 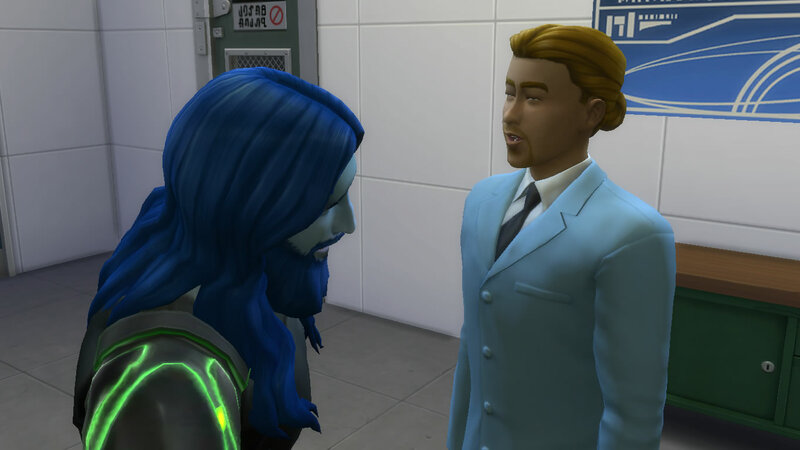 The effects of this transformation appear to be temporary, as this sim reverted to his original hair color and skin tone after the moodlet lapsed. – The Wormhole Generator is awesomely Fringesque. 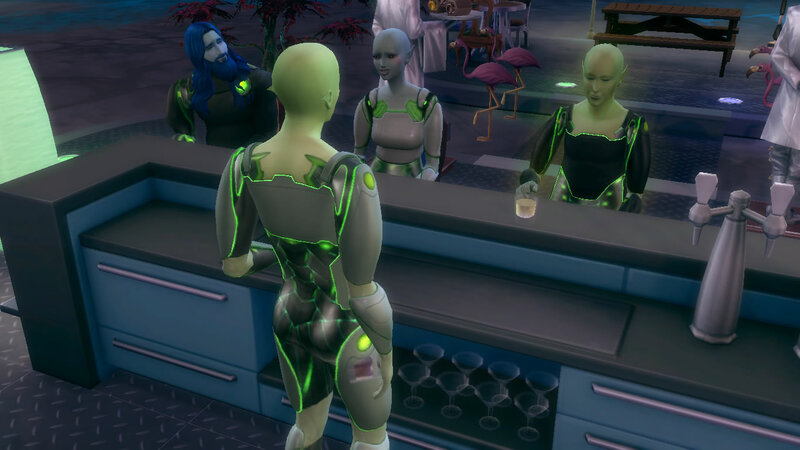 But the Rocket Science method leaves my Scientist more appropriately-attired for his visit to Sixam. – The aliens go by surprisingly Earth-like names, even when undisguised on Sixam. But this is likely because the game recognizes only one “full name” per sim. So the only listed name is how aliens introduce themselves to their human visitors, and what they go by when disguised on Earth. 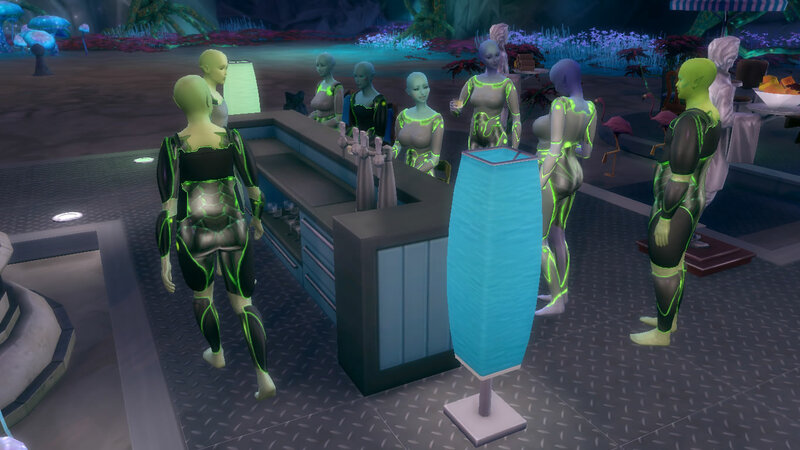 – After my Scientist reached L10, he received an invitation to attend an alien party at Sixam, during working hours. Fulfilling goals at this party fills up the job performance meter. 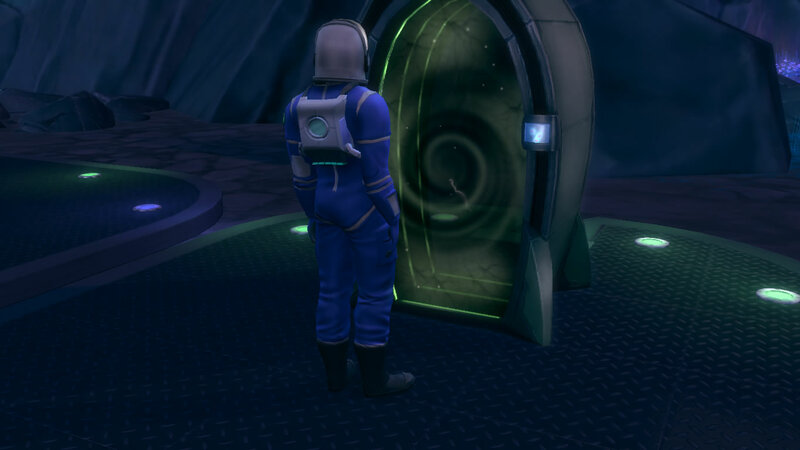 So it’s a good idea to prepare in advance, before your scientist reaches L10: Invent & upgrade the Electroflux Wormhole Generator, and/or Build the Rocket & Install the Wormhole Generator upgrade (requires L10 Rocket Science Skill).